Just a few days after Rodney Daal signed with the San Diego Padres, a second European prospect inked a minor-league deal with a MLB organization. 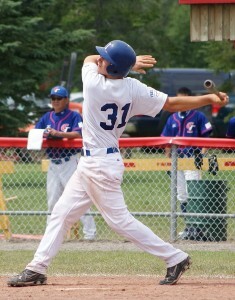 The 16-year-old catcher Alberto Mineo of the New Black Panthers from Ronchi dei Legionari will join the Chicago Cubs. He will start his professional career in the Australian Summer League, before making the trip to the 2011 spring training in Arizona. Mineo started playing Baseball at the age of six, attended the MLB European Academy in Tirrenia and was a member of several Italian national teams at various levels, including the juniors at the World Cup in Thunder Bay. According to the report on FIBS.it his best qualities are his arm and his bat. He also has good defensive skills and is very quick with the glove. Mineo played in the Serie B Federal Championship this season, batting .308 (OBP .473/SLG .446) with seven extra base hits, 21 runs and 21 RBI in 17 games for the New Black Panthers. He collected just two hits in 20 at bats during the AAA World Championship in Thunder Bay last month, playing in seven games for Italy.